With businesses becoming more mobile-centric and customer-experience getting more app-centric, it’s the time that mobile app development companies take quality compliance monitoring and management more seriously. Let’s see how the principles and tools of Agile methodology can contribute in creating bug-free, high performing mobile apps that elevate customer experience, help businesses to curb app uninstallation, and make a difference to their business bottom lines, including customer acquisition, workforce productivity, customer satisfaction, customer loyalty and brand reputation. The real journey of a mobile app starts, once it’s made available on the distribution platform, and users start downloading and using it. Consumers are the real evaluators of an app. Hence, there has always been an emphasis on judging the app’s performance against real world test cases, i.e., watching the behavior of the app when a user is downloading it, getting himself or herself registered with the app, accessing any information, and so on. If your product is in the development phase, ask your mobile app development company to create as many test cases as possible matching the real world scenarios. It’s easier said than done considering the multiple phases of an app and management of multiple mobile app development projects. Hence, to gain competitiveness, technology companies should not be reluctant in investing in Agile-based quality control and management tools. A beautiful aspect of Agile methodology for mobile application development is that test cases can be imported and exported as well. This enables the development companies to cope with the challenging TTM, i.e., time to market, and judge the performance of a built app against a robust set of test cases. The effort of the creation of test cases will fructify only when there is the effective execution of the software compliance plan and tracking of the app behavior. It’s also important that all stakeholders involved in the product planning and development, including UI-UX designers, developers and software testing staff stay in the know of the results obtained against test cases, and take corrective measures as and when required in their capacity. Today almost all types of Agile-compliant tools used for test case management and maintenance come with a powerful intuitive web-based user interface that helps with maintaining a greater visibility across different processes. Their developers and publishers have also paid attention in maintaining 3rd-party software compatibility. However, while going for any such tool, make it a point to check the compatibility of the software with your IT ecosystem comprising of project management or issues tracker software like GitHub, Taiga, Jira, and others. In fact, the adoption of Agile methodology for mobile application development into practice, helps software development companies with improving quality and quantity both with integrated teamwork. The 360-degree visibility into the mobile app development process also ascertains that constituent members work with a better sense of responsibility. This is the most important pillar of Agile methodology for mobile application development. Bugs and defects, if left unchecked, can lead to the rejection of an app by the targeted app distribution platform like Google Play or iOS App Store. Even if the app manages to dodge the distribution platform, it’s most likely to get rejected by users. Somehow, if it manages to survive, it will end up collecting poor reviews. 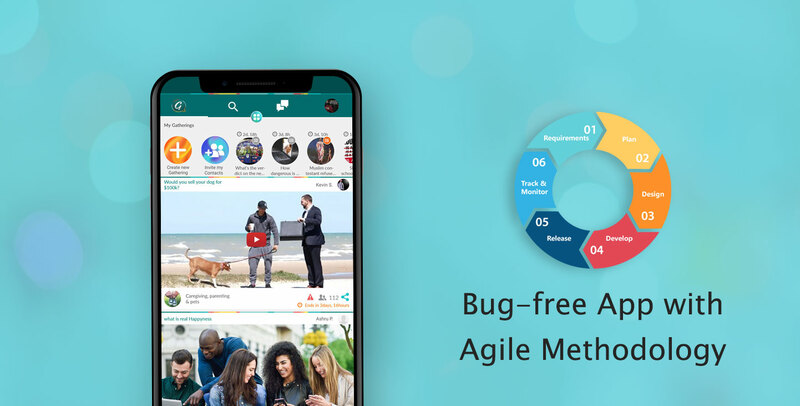 Agile methodology for mobile application development helps with effective management of bugs or defects, that is, identification and troubleshooting. Issues are reported to the concerned team and persons with precision and without any delay. This accelerates the issue resolution and the software enhancement processes and makes sure that the end product withstands the expectation of a business or client. Agile development methodology helps in creating a framework that can control and regulate not just the planning, development, testing and delivery of a product, but also its evolution over the course of time.